The team behind Playdot Apparel have gotten together with UK streetwear brands PXL Clothing and Terratag to put on a weekend sale at Brick Lane hot spot, the East Gallery. The sale sees the brands unite with a selection of other UK labels over 2 days, with Trapstar, Benjart, Silent London and more making an appearance. The sale will also play host to West London store Global Sports, who will be on hand to give attendees their trainer fix. 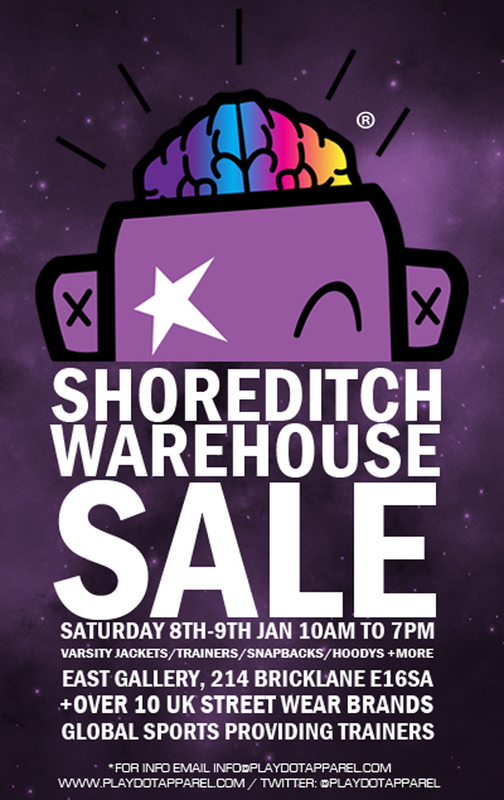 The sale takes place in a little over a week’s time – Saturday 8th and Sunday 9th January, 2011. Find full details on the flyer below. More info at Playdot and PXL. ohkay shud be agood 1! We always try and cover as broad a spectrum of brands as possible, from the big guys to the little guys. Of course, you won’t always find stuff that’s to your taste, but we have to accept that there are people out there that want to know about these things, and it’s our job to do our bit to inform them. I was at the sale today, great way for brands of this caliber to be out there! Shout out too Jerome for the help and the hook up from benjart and Dave from PXL clothing thanks for the talk and the red bull! I would love to see a recap on the event, great lil banter!